There were 714 press releases posted in the last 24 hours and 153,534 in the last 365 days. PALO ALTO, CALIFORNIA, USA, April 12, 2019 /EINPresswire.com/ -- Regalix has released the 11th issue of Digital CMO Digest. The latest edition of the power-packed marketing publication explores the topic of Customer Onboarding in detail. This edition comprises interviews with heads of Customer Success and Customer Experience of leading organizations like Salesforce, Verint and ADP, among others. They give their thoughts and insights about how a competitive and crowded hi-tech marketplace has made it necessary to not just live up to customer expectations but exceed them. The interviewees also share their insights about why critical customer processes like onboarding should be treated as customer journeys rather than as a series of touchpoints. The intricacies of customer onboarding, the direction in which it’s headed and the factors driving it are discussed as well. “Customer onboarding is critical to a company’s success as well as that of its customers. The emergence of the subscription economy has only served to make this even truer than before,” says Nimish Vohra, SVP – Marketing, Regalix. 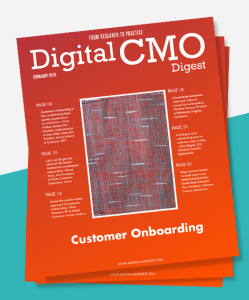 Digital CMO Digest is a Regalix publication that aims to support organizations across the globe to augment their marketing, customer satisfaction and retention initiatives. It does so by capturing the thoughts, perspectives and insights of market leaders and industry experts who are associated with digital transformation of marketing, sales and customer success. Each iteration of the publication shares expertise and analysis from senior executives and business leaders from multiple industries, which helps to equip Digital CMO Digest readers with the know-how to tackle their business challenges better. Regalix is a Customer Acquisition and Customer Success company that re-imagines digital experiences across hi-tech, ad-tech and retail domains. The company has partnered with some of the largest global B2B organizations in their efforts at customer acquisition, growth and retention. Regalix works with businesses, supporting their customers through the entire journey, to deliver reliable products and services in today’s subscription-based economy. Regalix has a long history of creating award-winning ventures with enterprises through co-innovation and idea-driven frameworks that inspire companies to think differently. Headquartered in Silicon Valley – Palo Alto, California – Regalix also has offices in Europe and Asia.